I recently had the good fortune to talk with Aaron Maurer, an amazing Iowa educator who I’m proud to call friend. Aaron also received one of ISTE’s 2018 Making It Happen Awards! Aaron invited me to participate in his Coffee for the Brain podcast and the end result is below. Betsy Corcoran, CEO of EdSurge, asked me to do two podcast interviews with her while I was at the EdSurge Fusion conference in San Francisco in October. The second recording is now available. 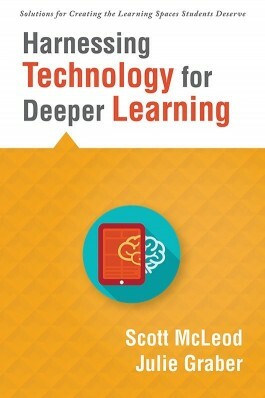 Betsy asked me to discuss the 4 Shifts Protocol; my new book, Harnessing Technology for Deeper Learning; and how we should be thinking about instructional redesign for deeper learning, greater student agency, more authentic work, and rich technology infusion. Betsy Corcoran, CEO of EdSurge, asked me to do two podcast interviews with her while I was at the EdSurge Fusion conference in San Francisco last month. The first recording is now available. Betsy asked me to reflect on the Did You Know? (Shift Happens) video series, its viral arc, and its educational impact. I had the privilege of being the guest for #IAedchat LIVE last night. Here is the video if you missed it. The conversation really gets started around 2:50. Happy viewing! Steve Hargadon and I are chatting tonight about school leadership in the 21st century. I hope that you’ll join us, share your thoughts, and ask some really tough questions. If you’re not subscribed to Steve’s Future of Education webinar series, you should be! My goal for June: 30 days, 30 book reviews. 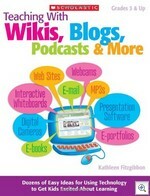 Today’s book is Teaching With Wikis, Blogs, Podcasts, & More: Dozens of Easy Ideas for Using Technology to Get Kids Excited About Learning, by Kathleen Fitzgibbon. My short recommendation? Stay away from this book. The only redeeming aspect of this book is that the author gives some ideas for classroom lessons and projects that may be useful for educators who are new to social media. There’s not much in this book. It’s only 48 pages long and is intended for grades 3 and higher. We bought this book thinking that it would be an interesting end-of-year gift for our son’s 4th-grade teacher. When it arrived from Amazon and we saw what it was, we gave her Will Richardson’s book, Blogs, Wikis, Podcats, and Other Powerful Tools for Classrooms, instead. The back cover of the book says “This book of quick tips and practical ideas shows how to fuse technology with everyday teaching. Readers will learn ways to use presentation software, e-portfolios, digital cameras, interactive whiteboards, and other teacher-tested tools to enhance learning and motivate students.” What you get, however, is simplistic and fairly unhelpful. That’s it. That’s the kind of advice you get for setting up your students’ blogs. If you can navigate these instructions successfully, you don’t need the book in the first place because you already know enough about blogs to make this happen. Again, I’m thinking that any educator that can do this successfully with the given instructions has no need for the book. The book is full of stuff like this. I give this book 1 highlighter (out of a possible 5). I was tempted to give it 0, but there are some redeeming ideas for future lessons scattered throughout the book. As far as I can tell, there isn’t much other reason for anyone to buy this book. Whatever’s in here can be better found on web sites and blogs. The New South Wales province in Australia is on a quest to outfit every Year 9 to 12 student with a customized Lenovo netbook by 2012. It is expected that over 200,000 computers will be distributed to students and teachers. If you’re interested, you can read more about the project or listen to a podcast about the initiative. I think this is a GREAT idea. Guess which high school graduates will be better prepared for a digital world: those who get to use computers in interesting and empowering ways on a regular basis or those who don’t? Below is the publicity video for the initiative (thanks, John Strange, for leading me to this). Happy viewing, everyone! The University Council for Educational Administration (UCEA) has started a new podcast channel and will be interviewing top educational leadership scholars from around the world about school administrator research and/or preparation. The first live podcast will occur tomorrow and will feature Dr. Karen Seashore, who holds the Rodney Wallace Professorship for the Advancement of Teaching and Learning at the University of Minnesota. Karen will be discussing the linkages between P-12 school leadership and student academic learning outcomes. As a former faculty colleague of Karen’s, I know her well and anticipate that this will be a great conversation. We here at CASTLE have been working with UCEA to get this up and running. CASTLE is one of several UCEA centers; I also serve as UCEA’s Associate Director of Communications. Stay tuned to the podcast channel to hear future interviews and, while you’re at it, sign up for UCEA’s Twitter feed if you’re interested in more school leadership resources. If you’d like to know what a good statewide 21st century school leadership development program looks like, have we got a podcast for you! This morning we had Episode 6 of 4 Guys Talking, the ‘talk radio’ podcast series from CASTLE. We spent the first 40 minutes talking with Chuck Heinlein, Director of the Leadership Center for 21st Century Schools at the West Virginia Department of Education. I think this was one of our best podcasts to date. Chuck shared a wealth of information about the statewide principal institutes that he’s running, and we learned a ton about the legislative supports, Department of Education commitments, funding and policy mechanisms, and other supports that are in place in the state. I have the sense that West Virginia really is trying very hard to move its schools (and its school leaders) forward in a thoughtful, progressive, sustainable manner. You also can subscribe to the 4 Guys Talking feed using iTunes or a RSS reader. Thanks to those of you who joined us live. I’m not sure when our next episodes will be but I will blog about them when I know. Happy listening! Update: I deleted the embedded BlogTalkRadio player that used to be in this post. Since it started playing automatically, I thought it was too annoying!